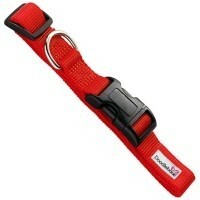 Doodlebone Bold Adjustable Collar (Red) is a fully adjustable collar that has been designed to offer your dog comfort and luxury. Made out of a strong Nylon material and machine stitched for additional strength, the collar also features a hard wearing plastic buckle for additional security. A large solid D ring allows almost any lead to be attached to it.